For more than 20 years, the Canadian Battlefields Foundation (CBF) has been actively and energetically involved in remembrance and commemoration activities. The cornerstone of the CBF remains its educational mandate. More than 250 university students and no fewer than 40 history teachers at colleges and institutions of higher learning from all across Canada have benefitted from our sponsored study tours. 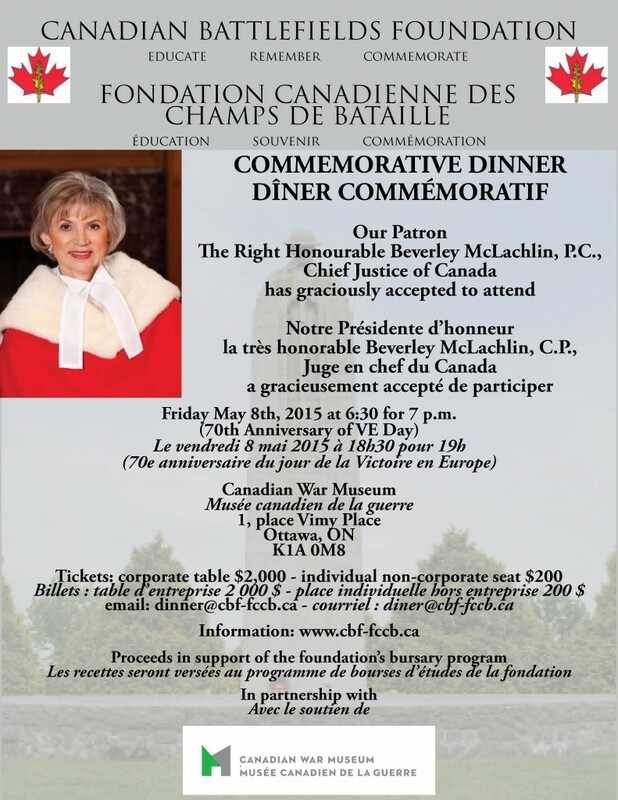 To highlight this important aspect of our mandate, the CBF is organising a commemorative dinner on May 8th, 2015 at the Canadian War Museum. In addition to remembering the numerous sacrifices of our courageous soldiers, this dinner will be an unprecedented event aimed at thanking publicly all our partners and donors for their generous and unfailing support towards the ideal and the objectives of the CBF. It will coincide with the 70th anniversary of VE Day and with the 10th anniversary of the inauguration of the new Canadian War Museum in Ottawa. You are all invited to this milestone event.